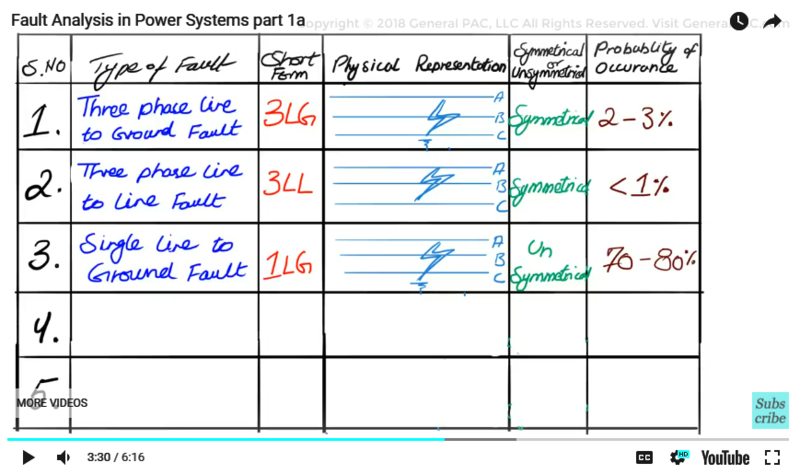 Fault analysis in power systems part 1a, This is the first part in the series called fault analysis in power systems, and in this series we will be going over the analysis of various types of faults that occur in power systems and at the same time intuitively understanding the hand calculations involved, now when we are talking about hand calculations we are actually talking about symmetrical components positive, negative and zero sequence components, because without those symmetrical components it will be very very difficult to calculate fault currents. Before we get into analyzing the different types of faults, let’s go over these faults in more general terms. So the first type of faults is called a three line to ground fault or a three line fault, now these two types of faults are quite similar to each other, The three line to ground faults are faults in where phases a b and c are shorted together and they are grounded, Now the three phase faults occur when you have phase a b and c that are shorted together but ground is not involved, The analysis and the approach of these two types of faults are exactly the same. They are both symmetrical faults and they produce a balanced fault output of the power systems. The probability of a three phase fault involving ground is 2 to 3% and the probability of just the three phase fault without ground is less than one percent. So both combined is a very very small probability, so it doesn’t occur a lot in power systems. Whereas when you have a single line to ground fault which is represented as 1 LG, now that is a type of fault that occurs when you have phase a shorted to ground or phase b shorted to ground or phase c shorted to ground. So only a single phase is shorted to ground so a single line to ground fault. Now this is an unsymmetrical fault type meaning that it will produce an unbalanced power system, as a result of it. The probability of this type of fault occurring is between 70 and 80%, so it’s quite quite quite common, and the reason why is imagine you have three phases on a pole that stretches for a mile and on both sides of pole you might have trees or even on one side of that pole you may have trees, limbs or other animals that are around it. So if a tree branch accidently brushes up against that line that will produce a line to ground fault. Where if an animal gets on top of the line and it accidently touches the line and the ground at the same time it will produce a line to ground fault or even a burn. 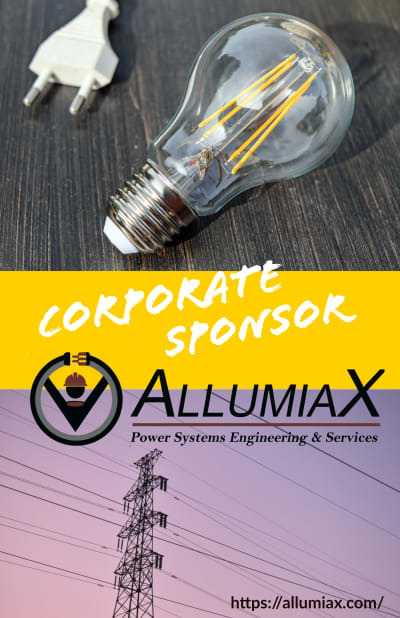 So this type of fault commonly occurs in power systems. So the next type of fault is called a line to line fault, The short term is 1LL, now this type of fault occurs between phase a and phase b shorted together, phase b and c shorted together or phase a and c shorted together, so it involves 2 phases and this type of fault is an unsymmetrical fault type, produces unbalanced power system characteristics and the probability of this occurring is only 15 to 20%. Whereas a double line to ground fault, which is essentially abbreviated as 2LG involves 2 lines as well as ground, a b and ground or b c and ground or a c and ground. So this is also an unsymmetrical fault type and only occurs less than 10 percent in the power system. For the one line to ground, the line to line and the 2 line to ground faults or unsymmetrical faults. And they are unsymmetrical faults because they make the power system unbalanced during the faulted condition. 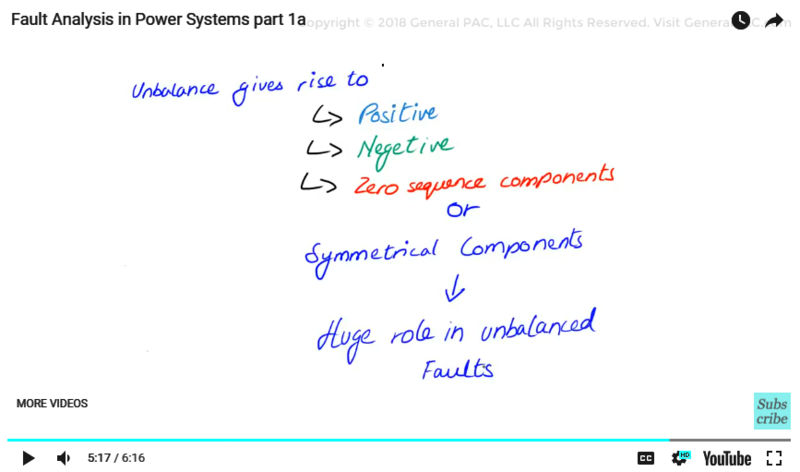 And if you don’t know what unbalanced or balanced means, There is another video tutorial that you can watch and it’s in the description section below, and this unbalance essentially gives rise to the positive negative and zero sequence components in three phase systems so this is exactly the reason why we have to have a solid understanding of sequence components, because sequence components or symmetrical components have a huge role to play in calculating unbalanced faults types. 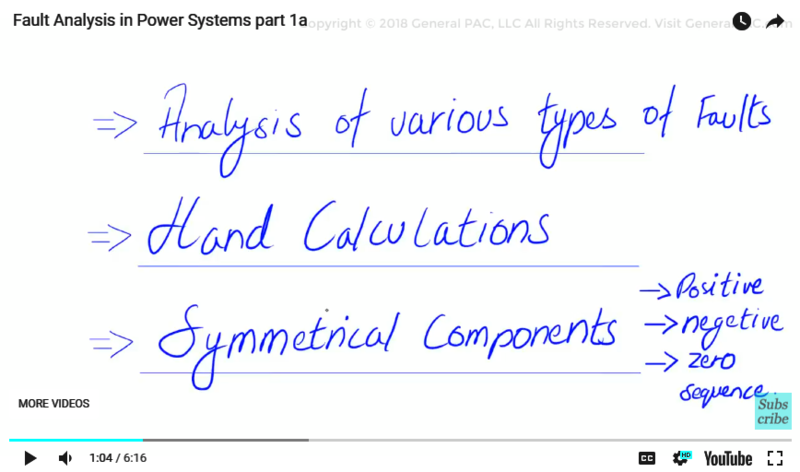 Good thing is that GeneralPAC has already created an excellent symmetrical components video tutorial, part 1a and part 2c are essentially mandatory to watch, please see the description section below for links to those specific parts. 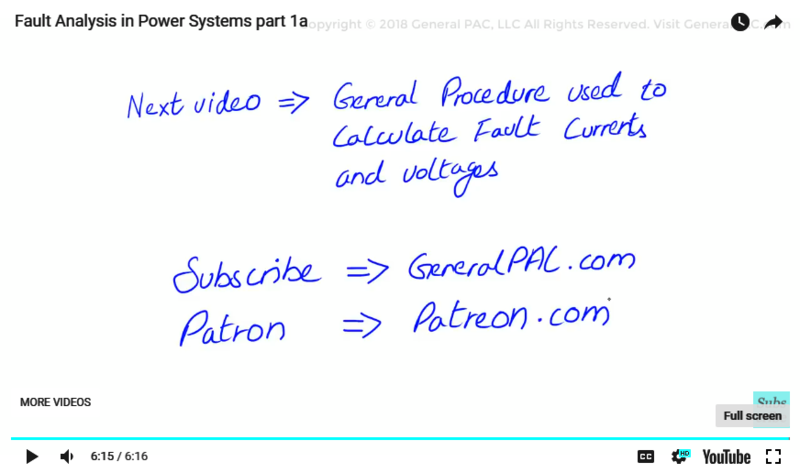 Now In the next video we will be discussing the general procedure, that is used to calculate fault current and voltages for power systems and We hope that you have a continued interest in this topic and in this series as either a student or a professional. And we also hope that you find this content useful and enlightening, please consider subscribing to generalpac.com or becoming a patron on patreon.com. GeneralPAC.com making power systems intuitive, open and free to everyone, everywhere, thank you.